"Jeannie Cho Lee" has rated the wine "Poderi Aldo Conterno Bussia, Barolo DOCG, Italy" from the vintage 2008 on 13.12.2012 with 91 of 100 points.
" A beautiful Barolo that is still very young but hinting at what it can offer in the future - blackberries, cherries, roses, roasted herbs and oolong tea. Enjoy this balanced red in about 4-5 years. Tasted in: Hong Kong, China. Maturity: Young. " "Wine Enthusiast" has rated the wine "Poderi Aldo Conterno Bussia, Barolo DOCG, Italy" from the vintage 2013 on 09.01.2017 with 94 of 100 points. "Wine Enthusiast" has rated the wine "Poderi Aldo Conterno Bussia, Barolo DOCG, Italy" from the vintage 2011 on 02.01.2016 with 94 of 100 points. "Wine & Spirits Magazine" has rated the wine "Poderi Aldo Conterno Bussia, Barolo DOCG, Italy" from the vintage 2011 on 01.12.2015 with 93 of 100 points. 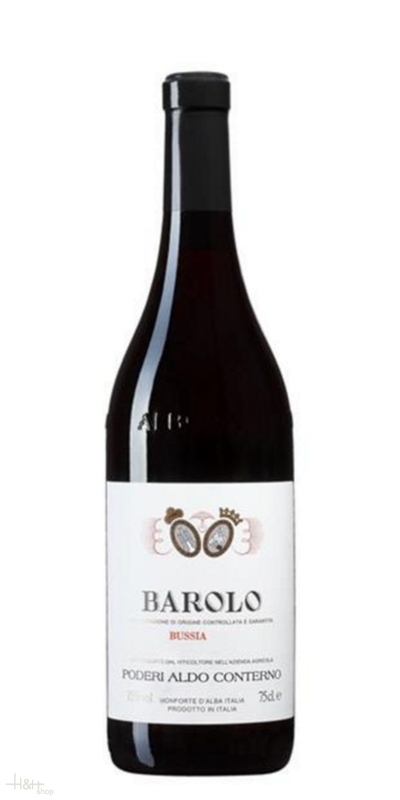 "Robert Parker The Wine Advocate" has rated the wine "Poderi Aldo Conterno Bussia, Barolo DOCG, Italy" from the vintage 2010 on 01.07.2014 with 95 of 100 points. "Wine Enthusiast" has rated the wine "Poderi Aldo Conterno Bussia, Barolo DOCG, Italy" from the vintage 2010 on 10.01.2014 with 95 of 100 points. "Luca Gardini" has rated the wine "Poderi Aldo Conterno Bussia, Barolo DOCG, Italy" from the vintage 2005 on 01.07.2013 with 91 of 100 points. "Falstaff Magazin" has rated the wine "Poderi Aldo Conterno Bussia, Barolo DOCG, Italy" from the vintage 2001 on 05.11.2005 with 89 of 100 points. "Vinum Wine Magazine" has rated the wine "Poderi Aldo Conterno Bussia, Barolo DOCG, Italy" from the vintage 2001 on 01.09.2005 with 16 of 20 points. "Vinum Wine Magazine" has rated the wine "Poderi Aldo Conterno Bussia, Barolo DOCG, Italy" from the vintage 2000 on 01.09.2004 with 16 of 20 points. "Wine Enthusiast" has rated the wine "Poderi Aldo Conterno Bussia, Barolo DOCG, Italy" from the vintage 1999 on 04.02.2004 with 87 of 100 points. "Wine & Spirits Magazine" has rated the wine "Poderi Aldo Conterno Bussia, Barolo DOCG, Italy" from the vintage 1997 on 01.12.2001 with 93 of 100 points. "Vinum Wine Magazine" has rated the wine "Poderi Aldo Conterno Bussia, Barolo DOCG, Italy" from the vintage 1997 on 01.09.2001 with 17 of 20 points. "CellarTracker" has rated the wine "Poderi Aldo Conterno Bussia, Barolo DOCG, Italy" from the vintage 1990 with 93 of 100 points. "CellarTracker" has rated the wine "Poderi Aldo Conterno Bussia, Barolo DOCG, Italy" from the vintage 1989 with 93 of 100 points. "CellarTracker" has rated the wine "Poderi Aldo Conterno Bussia, Barolo DOCG, Italy" from the vintage 2013 with 92 of 100 points. "CellarTracker" has rated the wine "Poderi Aldo Conterno Bussia, Barolo DOCG, Italy" from the vintage 2011 with 92 of 100 points. "CellarTracker" has rated the wine "Poderi Aldo Conterno Bussia, Barolo DOCG, Italy" from the vintage 2009 with 92 of 100 points. "CellarTracker" has rated the wine "Poderi Aldo Conterno Bussia, Barolo DOCG, Italy" from the vintage 2001 with 92 of 100 points. "Stephen Tanzer" has rated the wine "Poderi Aldo Conterno Bussia, Barolo DOCG, Italy" from the vintage 2010 with 92 of 100 points. "CellarTracker" has rated the wine "Poderi Aldo Conterno Bussia, Barolo DOCG, Italy" from the vintage 2000 with 91 of 100 points. "CellarTracker" has rated the wine "Poderi Aldo Conterno Bussia, Barolo DOCG, Italy" from the vintage 1996 with 91 of 100 points. Soave Classico Vigna Turbian - 2017 - Winery Nardello 15,35 EUR / 20,47 €/lt. Teroldego Granato - 2016 - Foradori 48,65 EUR / 64,87 €/lt. Bianco Secco - 2017 - Winery Quintarelli 31,60 EUR / 42,13 €/lt. Aphrodisium - 2005 - Casale del Giglio 31,15 EUR / 62,30 €/lt. Fibbio Rosso Conero - 1997 - Lanari Azienda Agricola 28,45 EUR / 37,93 €/lt. Rosso Novantasei - 1996 - Tasca d'Almerita Regaleali 17,35 EUR / 23,13 €/lt.